After more than a decade, the city of New Orleans has finally come to an agreement over three high-profile police-brutality cases from the lead-up and aftermath of Hurricane Katrina. 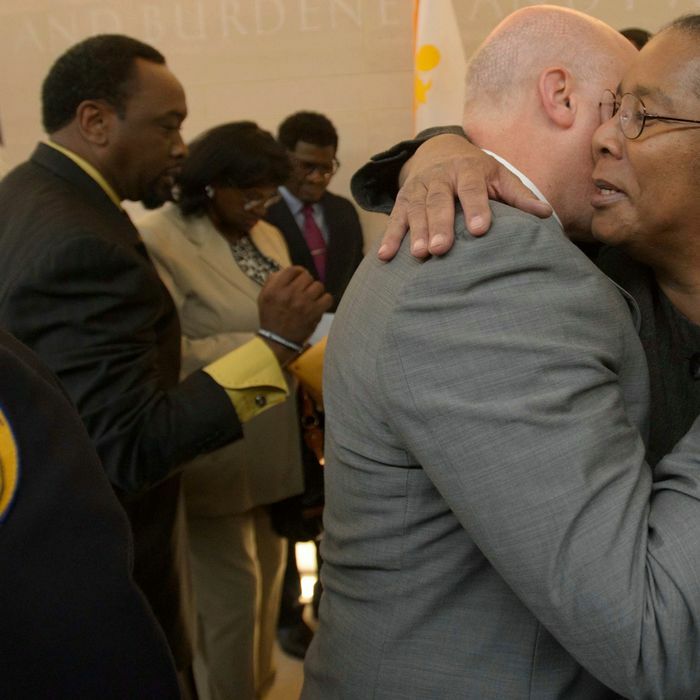 On Monday, standing with relatives of the victims, New Orleans mayor Mitch Landrieu announced his city’s willingness to pay out $13.3 million to settle the cases. He also apologized on behalf of the city and its police, and said that instances like what happened in 2005 would never happen again. “We are going to change as a people and we are going to change as a city because we choose to,” he said. The cases include the most widely publicized instance of police brutality to emerge from Hurricane Katrina. While trying to escape the inundated city, 60-year-old Lance Madison’s developmentally disabled brother was shot and killed by police officers who open-fired on a group of pedestrians crossing Danziger Bridge, killing two and injuring five. In an effort to cover up the murder, Madison himself was arrested and held for weeks, accused of attempted murder. Other plaintiffs in the settlement included the families of Raymond Robair and Henry Glover. Robair, a 48-year-old handyman, was beaten to death by police officers near his home a month before the hurricane. In September of 2005, Glover was severely wounded when a rookie police officer guarding a shopping mall in Algiers shot him. The officer did not help Glover, but a passing driver tried to, driving him to a temporary police outpost. Instead of administering first aid, the police there allowed Glover to die, then beat the driver of the car and two members of Glover’s family, left his body in the car, and lit it on fire. Ultimately, three of the five officers who went on trial for the death and cover-up were convicted, although only one of their convictions still stands. Two police officers were convicted in the death of Robair, and five in the Denziger Bridge shootings — a further 11 pleaded guilty. Stories like these led to widespread condemnation, and after taking office Landrieu invited the Justice Department to investigate and audit the New Orleans police department. What they found was damning and resulted in a federal consent decree — a mandatory reform that is still in effect — as well as charges for 20 police officers.